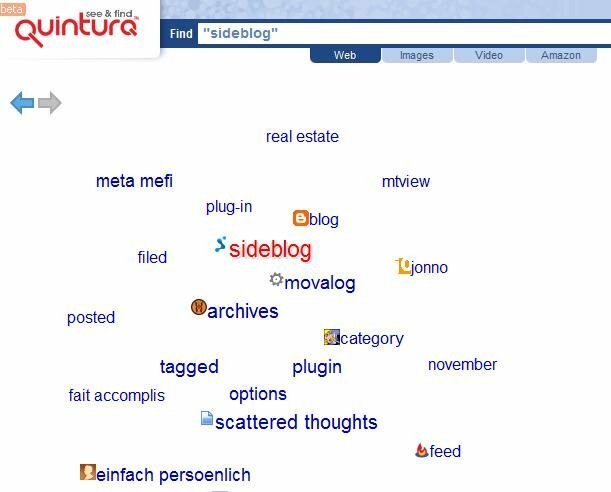 I thought the battle for search was done and dusted, but I guess that’s before I discovered tags and the semantic web. Still, I have my means of getting information in the way I want it and short of paying Google for the pleasure, am happy to hit their energy-sapping home page. Take a look at these other search engines, and the great narrative they are presented in (would have liked links). I rate Kartoo and Quintura, because they attempt to define the non-linear relationships of the cloud, and its quick-loading and fun. And read this article about all the various new search engines and what they bring to the party.